Does layout of storage equipment provide maximum capacity and thru–put efficiency in your operations? Has aisle size and equipment orientation between docks been carefully considered? At Western Pacific, our engineers can work with your team to help provide the most efficient storage medium for quick moving product VS slow moving products. They can talk to you about flow between reserve, prime locations and independent functions. From receiving to storage to conveying to packaging and back to shipping, talk to Western Pacific Storage Solutions about your overall eCommerce plan. BEFORE Note here that smaller products are not in the correct storage medium. 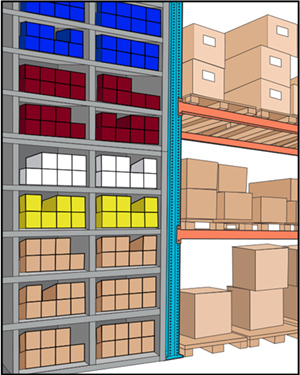 In today’s warehouses and distribution centers, space savings can fairly quickly translate into money savings and in this image, space is being wasted where the small products are stacked. 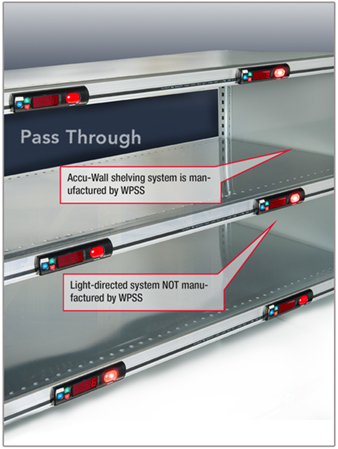 The Western Pacific Accu-Wall shelving system. Accu-Wall integrates with any put-to-light or pick-to-light system you may obtain from those who manufacture light-directed tecnology. It’s all about speed and accuracy in eCommerce. At the warehouse and distribution center level, the Omni-Channel, consumer-centric experience requires optimized throughput and increased accuracy. 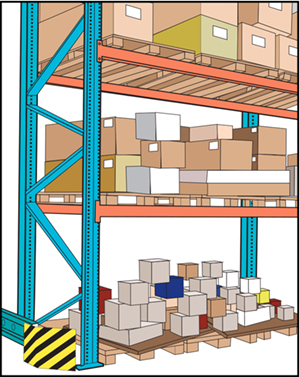 Warehouse and order fulfillment centers must select shelving expressly designed to eliminate human error. Accu-Wall can help.